I wrote about Slender Kitchen Meal Plans back in January and I want to talk about them again because it is February. Slender Kitchen Meal Plans make life easy because they include recipes, shopping lists, and nutritional information (including SmartPoints) to help you eat healthier. 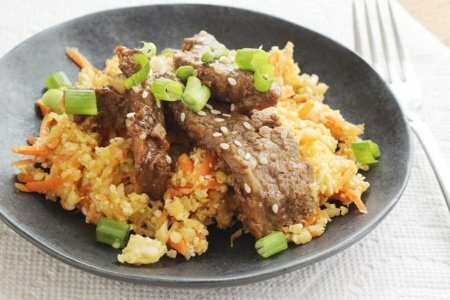 I made Sesame Beef and Low Carb Cauliflower Fried “Rice” from week five of Kristen’s plan and it was A HIT. This was one of the meals in the plan that I saved for Saturday because it was time intensive but I loved the result. 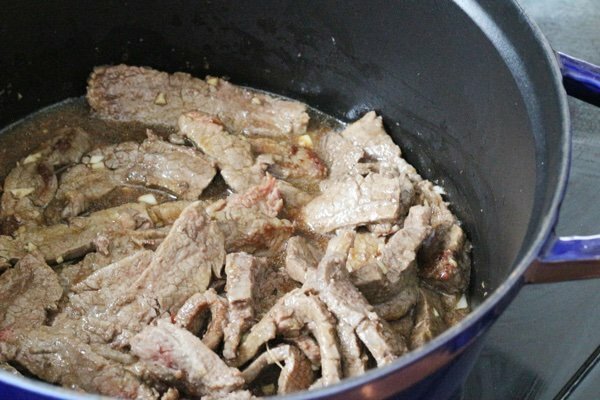 The first recipe – Sesame Beef – used flank steak as a lean source of protein. It is running $10 per pound where I live so it is good to savor it. The recipe is really simple. You brown the beef and then toss it in the oven with spices and broth. My kids went nuts over this and demanded that I make it again. Preheat the oven to 400 degrees. In a small bowl, whish the beef stock, sugar, sesame oil, garlic, soy sauce, and white vinegar together. Set aside. In another bowl, toss the beef with the salt, pepper, and flour. In a large oven-safe pan, heat the olive oil over medium heat. Once hot, add the beef in one layer. Cook for three minutes on one side until seared and then flip and cook for another three minutes on the other side. Add the beef stock mixture and place the entire pan in the oven (uncovered). Cook for 15-20 minutes. Then toss the beef with sesame seeds and serve. 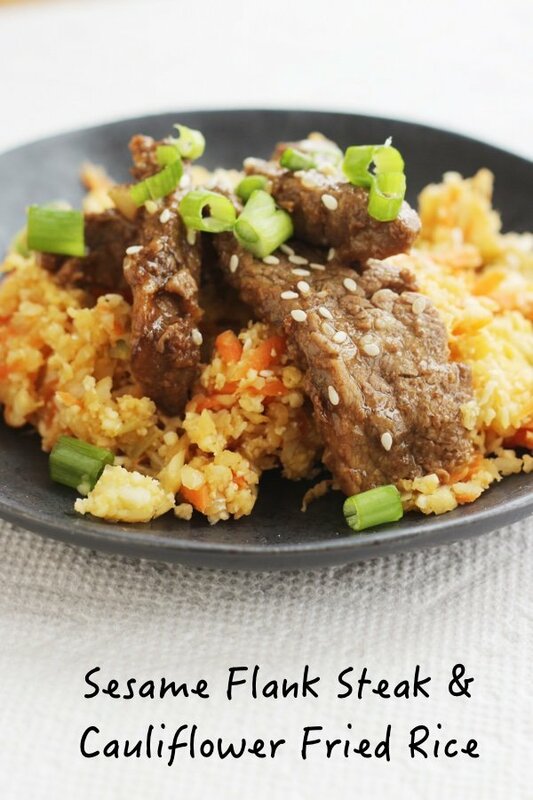 The recipe that Kristen paired with the beef is a ”fried” version of cauliflower rice so it is very low carb. As you all know, I am a big fan of cauliflower so I knew I was going to like this. Before you combine the ingredients you must “cook” the cauliflower rice which means you put it in the microwave for 2 minutes until it softens. Take THAT real rice. I thought this was easy and while it did not taste like real fried rice (not as greasy or heavy) – it was delicious. 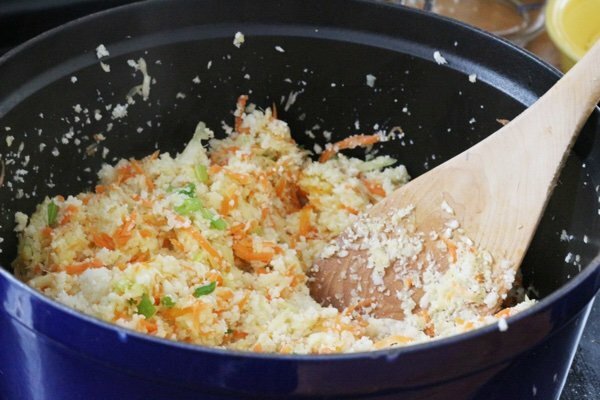 Use a bag of prepared coleslaw mix instead of buying a cabbage and carrot. Use a tube of minced ginger (instead of mincing it yourself). 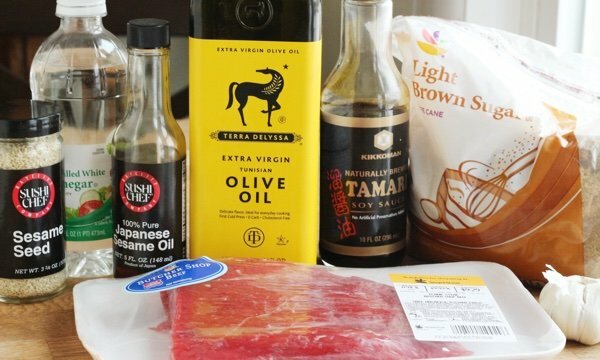 I cut the amount of soy sauce that I used for this recipe in half and it tasted delicious. If you are cutting down your sodium, don’t hesitate to adjust this recipe for your needs. Sign up here - -Slender Kitchen Meal Plans to get going. Place the cauliflower in a food processor and pulse until in small rice like pieices. Microwave or steam for 2-4 minutes until soft. Heat your pan over medium-high heat. Whisk together the egg and egg white and season with salt and pepper. Add 1 teaspoon of vegetable oil to the pan. Add the eggs and cook until just scrambled. Remove from pan and set aside. Add the remaining vegetable oil and sesame oil to the hot pan. Add the scallions, cabbage, carrot, garlic, ginger, and any other veggies you like. Cook for 1-2 minutes until they just begin to soften. Add the cauliflower rice and cook for 2-4 more minutes, stirring constantly, until the rice begins to crisp up. Add the soy sauce and egg. Stir together and cook for one minute. Regarding the cauliflower rice, is it really necessary to pre-cook it since its already so small? Won't it saute to an al dente stage? I'm only asking because the other harder veggies are seemingly softening. 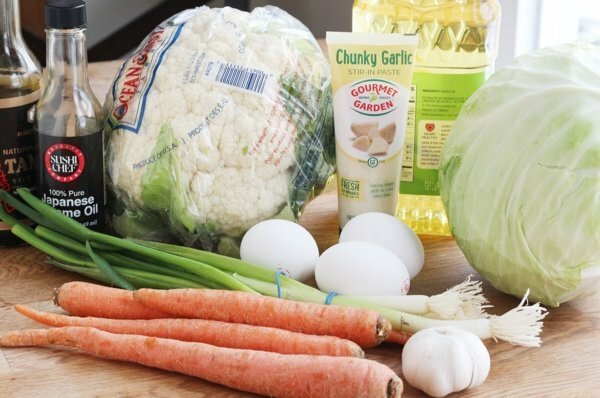 You're right, its time-intensive with the cauliflower but not so much with plain white or brown rice which can be made on a Monday and used all week. This beef recipe is a fast school night meal this way. Kids love the chow mein noodles too as an occasional treat. I did sign-up for Slender Kitchen Meal Plans in January, since it is one of my favorite food blogs with some great recipes. I finally took the time to investigate and start using over the weekend; it looks fabulous! Very user friendly. I'm looking forward to getting back into weekly meal preparation and doing some cooking! Didn't you have a post about Plate joy too? Or am I thinking about someone else?